This month’s top-rated supplier is Appeagle, who provide an automatic repricing tool for sellers on Amazon, eBay and Rakuten. Automatic marketplace repricing is hot, in more ways than one. Some sellers praise it for significantly growing their business. Others despise it as a destructive “race to the bottom”. The market for repricing tools is buzzing too, with a new provider popping up every month, it seems. And repricing bugs have hit the news, causing big losses for sellers and big wins for buyers. Love it or hate it, automatic repricing is here to stay. More than that, if you sell competitive products on Amazon it’s pretty much essential. So which tool is best? As always, that depends on you and your business. But I can tell you which tool Web Retailer members rate the highest: Appeagle. I caught up with Appeagle CEO and co-founder Koby Kasnett, and marketing manager Izabella De Souza, to find out more about them. Koby: At first I started in the web development industry with my business partner, Aaron. It was very up and down and we had months where there wasn’t a lot of work. So back around 2009 I started selling radar detectors on eBay to pull in some side money, and I saw the potential in online selling on the marketplaces. Having a development background my mind naturally went straight to “How do we automate this work? How do we run this business with the least amount of manual input?” So we started thinking about the pain points as a seller. I didn’t have to think that hard. Once a week, twice a week, I’d go on eBay, search through all my listings and change the prices based on where my competitors were at. But I wasn’t kidding myself. There was no such thing really as manual competitive pricing because five minutes later my competitors had changed too. It wasn’t an efficient way to do it. I started researching what’s out there, and found a very clandestine approach to repricing at that time. There were only one or two other services that were offering it. So we said, “You know what, let’s build it for ourselves, let’s see if this is something that’s going to work and if people are interested in it.” And that’s how it happened. We built it for ourselves, we tried it, and it was incredibly successful. It eliminated the manual work and was repricing 24/7 so we were able to spend our time on other things. It’s interesting that you mention eBay first, rather than Amazon. Most sellers really associate repricing with Amazon, and don’t even think of it on eBay. Koby: eBay was the marketplace I got involved in first. Amazon at the time was very difficult to get started with – there were a lot of limitations and prerequisites as a business. So we just decided to go with eBay first and we got really into it. But once we did go onto Amazon we quickly realized that it’s a completely different type of consumer. It’s a very different type of marketplace and it’s a different type of buyer. That changed things in our minds, especially when it came to repricing. We realized most people using repricing would be businesses and felt that the majority of them were on Amazon, while we saw a lot of individual private sellers on eBay. So our focus definitely shifted to Amazon. I’m happy we did because eBay started lagging behind with their API, and with their catalog capability. It took years for them to get where they are now and it’s not even complete. There was a lot of frustrations like that with eBay, so we shifted our focus completely to Amazon at that point. But you still support eBay, don’t you? Koby: Absolutely. It’s not as extensive as Amazon because of the limitations with the catalog. If someone’s selling an item where we have no way of identifying it to, either by a UPC or another ID number, we can’t reprice that item because we can’t accurately pull in competitors for it. How do you think automated marketplace pricing has developed in the years since you first got involved in it? There’s upsides and downsides to scraping. You might be able to get more information but it might not be accurate. An API is always the better route to go. But the Amazon API wasn’t developed back then for tools that wanted to handle prices, so the efficiency and reliability of repricing tools just wasn’t on the same level as today. There were kinks and bugs and many things that didn’t work the way they should. In the last two to three years Amazon released their subscription API, and a lot more tools are popping up. Software as a Service (SaaS) in general is blowing up. I think sellers are getting used to standalone services and tools that take care of different aspects of their business. They’re no longer expecting to sign up for one tool that does everything. Over the years we put a tremendous amount of focus on our team, our security, our QA [quality assurance – testing] process, and the software methodologies we use. As well as broadening the settings that we offer, the different types of repricing, whether it’s algorithmic or customized. And we constantly add more customization tools. We have a really, really great development team in place right now. I know a lot of people will be worried about using a repricer in case it makes a mistake. How does your QA process work and what else do you do to make sure that the platform’s reliable and bug-free? Koby: When we experienced a bug back in 2012 we were just three people, and to be completely honest we didn’t have the right processes in place. We were a young company and as most young companies can say, you learn from your mistakes and you move on. And the most important thing is that you don’t experience them again. I think we’ve been incredibly lucky to experience something like that early on. It caused us to put a tremendous amount of effort and focus into our processes, and into hiring the right people that would ensure it doesn’t happen again. So we’ve set up all kinds of automated system alarms. As soon as a high urgency alarm is triggered, like a large number of listings all going to a penny, it stops any changes from going to the marketplace. That’s one thing that we’ve put in place and there’s a number of different triggers for those notifications. But the development process is really where it should begin. We do peer reviews where each developer hands their work to another developer to check everything over. From that point it goes to QA and a three-tiered process of testing against many, many different types of situations. We use a lot of different data from our sellers where we take sellers that are as different as possible, clone their data, and run tests against it, just to ensure we’re covering every possible scenario. We use Amazon for our infrastructure and have multiple redundancies [Andy: duplicated hardware in case of failure]. We always ensure that the IP address is ours, as it’s something that a lot of sellers are worried about. But the most important thing at the end of the day is the team. I have a tremendous amount of pride in the team that we’ve put together. With the right people you end up with a great product. If you have a great team and everybody believes in what you’re doing, everybody’s working for the same thing, then the result is something really awesome. So what happens after testing is finished? Koby: Once we’re running all our different test scenarios, and we’re not getting any bugs, we’ll start our official beta program. We usually start with ten or twenty accounts and log them on one by one. It’s a very personal, one-on-one process. These are clients that we know will give us a lot of feedback. We’ll test a small seller but usually try to target the larger ones because there’s more data to test against, and they’re more complex businesses usually. We spend as much time as we need with these sellers and then open it up little by little until we really feel confident that we’ve hammered out all the kinks. What’s the team like at Appeagle? How many of you are there and where are you all based? Koby: We’re 22 now. Over the last two years we basically went from two people to 22. It’s been exciting and a nice two years of constant growth, and we’ve moved offices a few times already. There’s a lot of momentum and excitement in the plans going forward. We are all in one office and that’s very important to us because we all work very close together. The office is in New Jersey, about 20 minutes out of Manhattan. Our dev team is really where our focus is. We really put a lot of focus on hiring the best developers and the right ones that fit into the company. That’s the largest team, after all we are a software firm. The culture isn’t completely autonomous but we try to instill autonomy within teams. We don’t really have hierarchies. I’m the CEO and Aaron’s the CTO, but we don’t use the titles within the company. We try to describe ourselves in the work that we do rather than titles that don’t mean anything. We really try to stay away from the corporate and be ourselves. It goes a long way when it comes to the creativity, and everybody having a voice. People want to work for a company where they’ll have that voice and where they can make a difference. That says something about them, as an employee, and those are the type of people that you want to hire. People get excited when they come here, and that tells us we’re doing something right. We’re also completely self-funded and 100% owned. We stayed alive by selling on eBay and it’s ironic to me that’s what turned into the business. People ask me, “Did you always know what you wanted to do?” but it was a little bit of luck. We started selling radar detectors and there was no thought that it would turn into anything. Things happen and you go with the flow. As things fall into place, when you see that opportunity just go for it. Even if it’s completely different than what you are doing at that time. What makes Appeagle different from all the other repricing tools out there? Koby: We put a tremendous amount of time into the customer. Right from the beginning we want to make sure they’re not on their own. We realize repricing is sensitive, so we try really hard to give them an experience where they know we’re here, and it’s our job to help with stuff they might not understand. The experience we give to the customer is something that sets us apart, we hear it all the time from customers. Part of our on-boarding process is learning about a seller’s product lines, the type of business they are, what categories they sell in, and their competitors in those categories. We invite them to set up a group of products under an algorithmic strategy and another group under a custom strategy. That’s what the free trial is for – working very closely with sellers, making sure they understand what different settings do, and how different inventories they’re carrying may need very different strategies. Izabella: Our customers also tell us that our interface is very intuitive – the easiest to use that they’ve come across, and offers the widest range of customizable features. We also have people saying, “Anything that I possibly could want to do as far as a strategy for repricing, Appeagle allows me to do it.” That’s the feedback we hear consistently from users who have been with us both short and long term. What have you got planned for Appeagle? Koby: We are releasing an entire overhaul of the product. It’s not going to be completely unfamiliar to people so they to have to relearn stuff, but it’s prettier, cleaner, simpler. We didn’t want to introduce something that was more complex, so we focused very hard on making things simpler, but more powerful. We added a lot of functionality and we display it to the more advanced users, but we don’t want to shove a million things in front of someone’s face so they don’t know what’s going on. We’re going through the beta testing right now, and are going to release it this month. We believe that it’s going to change the game. People will be able to get right into repricing and really understand what it is, and the different ways to use it. For us it’s a lot more about the education these days, how you can use repricing to stay ahead, and also how not to use it. Some of the ways people use repricing aren’t really effective, and end up with a drop in prices and ruining the market for some products. That stuff really needs focus. We also have pre-configured strategies that we’ll be rolling out with the new tool. That’s going to make it very easy for sellers who want more control. They are based on the most common strategies we’ve seen people use, based on our experience on-boarding new users. Our vision doesn’t end at repricing. Our focus is automation and data. We would like to expand Appeagle into a tool that takes daily tasks that nobody wants to do, tasks that require a team of five people, and automate those for businesses. But not only that, also deliver the data that goes along with it. We feel there are businesses out there really running with a tremendous lack of data, and maybe they’d drive their business in a different direction if they actually knew the data that was coming out of their sales. How does it work with algorithmic repricing or rules-based configuration. Do you have to choose? Koby: It’s basically a choice of one or the other. You can change a couple of settings with algorithmic, but there’s not much you can do because it works in a very specific way. The goal with algorithmic is just to be in the Buy Box at the highest possible price. The success factor would be getting someone there at a higher price than their competitors. The custom strategy tools give them a lot more control in terms of who they’re competing with, how, and when. There’s a huge need for that because a lot of businesses aren’t eligible for the Buy Box. We’d be excluding a large part of the market by only offering one approach. We don’t force users to choose one strategy for all their listings. 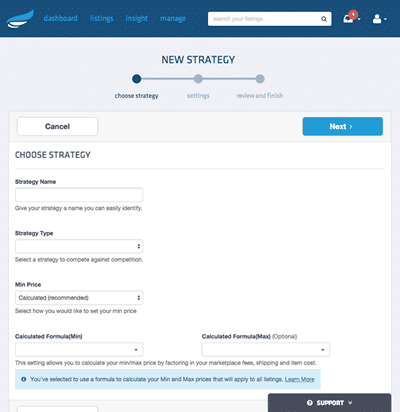 We let them have as many strategies as they want, and assign any strategy to any listing. So they have that control at a individual listing level. They might not be eligible for the Buy Box for a certain category of products they carry, while another group of products just have to be sold and they don’t care so much about the profit margins. Izabella: There’s a big misconception that repricing is a race to the bottom. That is not the case with a tool like Appeagle, because you’re able to offset the things that would drive you to the bottom by customizing the rules. We work very well for sellers who use a mix of FBA as well as merchant fulfilled, for example. It’s really about increasing profit margin because that’s what allows for real business growth among sellers. 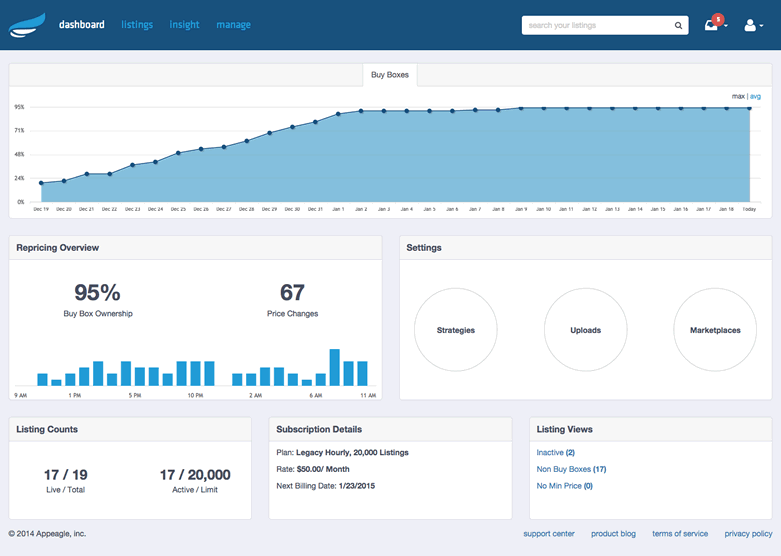 How can sellers find out more about Appeagle, if they’re not ready to sign up for the trial? Koby: There’s information on our website, and they can very easily call us or use online chat. They can also email sales@appeagle.com. We have a team of people who talk to sellers reaching out to us through our website. We put a lot of effort into talking with as many people as possible. It’s not all about pushing them into the free trial. Sometimes there are people who need more of an inventory and listing solution on top of the repricer. It’s all about identifying the right type of client and getting them started, walking them through it, showing them a demo. Thank you both for taking the time to tell us all about Appeagle, and congratulations on having the top-rated repricing tool on the site!